Thread Check, Inc. offers a complete line of AGD ‐ American Gage Design, unified working taperlock thread plug gages. 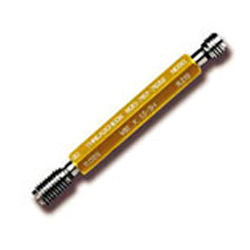 The taperlock thread plug gage style allows for a quick and convenient replacement of the gage member into an existing handle. A worn gage member can be simply removed and a new replacement inserted into the handle. Thread Check’s taperlock thread plug gages are manufactured per ANSI/ASME B1.2. 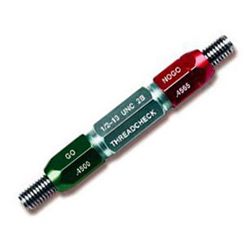 Thread Check, Inc. taperlock thread plug gages are manufactured to an X tolerance in class 2B or 3B. 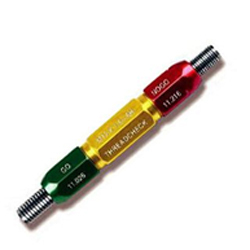 Taperlock thread plug gages are available in UNC, UNF, UNEF, J and specials. 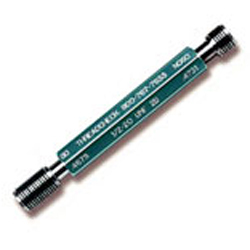 All standard taperlock thread plug gages are stocked in hard chrome coating which extends the wear life of the gage by more than a 100% thus providing dramatic savings in replacement costs. All Thread Check, Inc. gages are manufactured to the high end of the tolerance to ensure longer gage life. Thread Check, Inc. manufactures taperlock thread plug gages in carbide, ceramic and other types of specialty steels. Thread Check manufactures many types of special gages including pre‐plates, multiple starts, special leads, acme threads, buttress threads, square threads, extra length thread gages, and custom gages to print. All thread plug gages are traceable to N.I.S.T. #0-80-TPG-2B GO #0-80 UNF 2B Go Taperlock Plug 0.060 #0 80 .0519"
#0-80-TPG-2B NGO #0-80 UNF 2B No Go Taperlock Plug 0.060 #0 80 .0542"
#0-80-TPG-2B-D/E #0-80 UNF 2B Go/No Go Taperlock Plug Gage w/handle 0.060 #0 80 .0519" - .0542"
#0-80-TPG-3B GO #0-80 UNF 3B Go Taperlock Plug 0.060 #0 80 .0519"
#0-80-TPG-3B NGO #0-80 UNF 3B No Go Taperlock Plug 0.060 #0 80 .0536"
#0-80-TPG-3B-D/E #0-80 UNF 3B Go/No Go Taperlock Plug Gage w/handle 0.060 #0 80 .0519" - .0536"
#1-64-TPG-2B GO #1-64 UNC 2B Go Taperlock Plug 0.073 #1 64 .0629"
#1-64-TPG-2B-NGO #1-64 UNC 2B No Go Taperlock Plug 0.073 #1 64 .0655"
#1-64-TPG-2B-D/E #1-64 UNC 2B Go/No Go Taperlock Plug Gage w/handle 0.073 #1 64 .0629" - .0655"
#1-64-TPG-3B GO #1-64 UNC 3B Go Taperlock Plug 0.073 #1 64 .0629"
#1-64-TPG-3B NGO #1-64 UNC 3B No Go Taperlock Plug 0.073 #1 64 .0648"
#1-64-TPG-3B-D/E #1-64 UNC 3B Go/No Go Taperlock Plug Gage w/handle 0.073 #1 64 .0629" - .0648"
#1-72-TPG-2B GO #1-72 UNF 2B Go Taperlock Plug 0.073 #1 72 .0640"
#1-72-TPG-2B NGO #1-72 UNF 2B No Go Taperlock Plug 0.073 #1 72 .0665"
#1-72-TPG-2B-D/E #1-72 UNF 2B Go/No Go Taperlock Plug Gage w/handle 0.073 #1 72 .0640" - .0665"
#1-72-TPG-3B GO #1-72 UNF 3B Go Taperlock Plug 0.073 #1 72 .0640"
#1-72-TPG-3B NGO #1-72 UNF 3B No Go Taperlock Plug 0.073 #1 72 .0659"
#1-72-TPG-3B-D/E #1-72 UNF 3B Go/No Go Taperlock Plug Gage w/handle 0.073 #1 72 .0640" - .0659"
#2-56-TPG-2B GO #2-56 UNC 2B Go Taperlock Plug 0.086 #2 56 .0744"
#2-56-TPG-2B NGO #2-56 UNC 2B No Go Taperlock Plug 0.086 #2 56 .0772"
#2-56-TPG-2B-D/E #2-56 UNC 2B Go/No Go Taperlock Plug Gage w/handle 0.086 #2 56 .0744" - .0772"
#2-56-TPG-3B GO #2-56 UNC 3B Go Taperlock Plug 0.086 #2 56 .0744"
#2-56-TPG-3B NGO #2-56 UNC 3B No Go Taperlock Plug 0.086 #2 56 .0765"
#2-56-TPG-3B-D/E #2-56 UNC 3B Go/No Go Taperlock Plug Gage w/handle 0.086 #2 56 .0744" - .0765"
#2-64-TPG-2B GO #2-64 UNF 2B Go Taperlock Plug 0.086 #2 64 .0759"
#2-64-TPG-2B NGO #2-64 UNF 2B No Go Taperlock Plug 0.086 #2 64 .0786"
#2-64-TPG-2B-D/E #2-64 UNF 2B Go/No Go Taperlock Plug Gage w/handle 0.086 #2 64 .0759" - .0786"
#2-64-TPG-3B GO #2-64 UNF 3B Go Taperlock Plug 0.086 #2 64 .0759"
#2-64-TPG-3B NGO #2-64 UNF 3B No Go Taperlock Plug 0.086 #2 64 .0779"
#2-64-TPG-3B-D/E #2-64 UNF 3B Go/No Go Taperlock Plug Gage w/handle 0.086 #2 64 .0759" - .0779"
Long Form Calibration - add $15.00 per gage member. Special gages including preplates, multiple lead, ACME, Buttress, extra length, etc. are priced promptly on request.